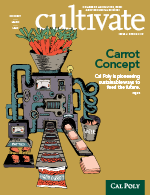 The quarterly magazine of the Cal Poly College of Agriculture, Food and Environmental Sciences. The College of Agriculture, Food and Environmental Sciences is investing now in state-of-the-art buildings, technology and programming. Read the full Report. Recent graduate report shows 92 percent of CAFES graduates found jobs related to their major. View the full report.